All of us, at one point or another, have answered that question about having dinner with any three people from any point in history. My answer is always Abigail Adams, Jane Austen, and some rotating third figure depending on my mood. Sally Ride, maybe, or Eleanor Roosevelt, or Princess Leia (what, you didn’t mean *Earth-bound* historical figures, did you? Well in that case, Michelle Obama). Of course, when you can’t meet them, you can go stand by the window where they sat and absorb the genius vibes, instead. 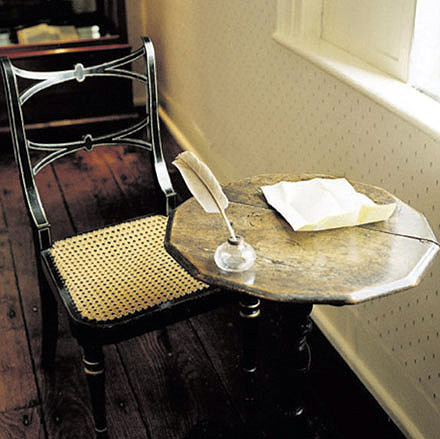 Jane Austen’s writing table, Chawton. The point is, most of us answer that question with the names of people we have no chance in this reality of ever meeting, death and the Secret Service generally being no-nonsense sorts of barriers. It doesn’t change the fact that meeting people you admire can be an amazing kick-start to your own sense of self. A number of years ago now, I went to a panel on ‘why write fantasy?’ hosted by the Cambridge Public Library, featuring a discussion between two of my literary heroes, Susan Cooper and Gregory Maguire. I spent the entire two hours or so pretty much vibrating out of my seat with joy, most especially when Susan Cooper said she writes fantasy because ‘that’s just the way [her] brain works.’ She wants to write a Shakespearean historical fiction, or about Nelson and the Napoleonic wars, they turn into time travel stories. It was among the top five most validating things I’ve ever heard in my life, and she wasn’t even talking to me. And when it was my turn to get my book signed, I managed not to sound like an idiot (progress!). We talked about her dragons-in-ancient-Rome short story, and discussed how cool her Anglewing dragons were, and even though I said absolutely nothing to her about being a writer myself, I came away inspired and heartened. Because she’s not so different from me, and she reads authors I read and writes things in the genres I write, and my first drafts don’t sound so much rougher than the piece she read us all. And since our brief conversation on Sunday I’ve managed to write over 6K words of my own current project. So it matters, meeting the writers you admire, because while it’s easy enough to throw up your hands and say “I don’t know how they do it!” the next step is to bring those hands right back down to the keyboard. This entry was tagged authors I admire, books I'm reading, inspiration. Bookmark the permalink.